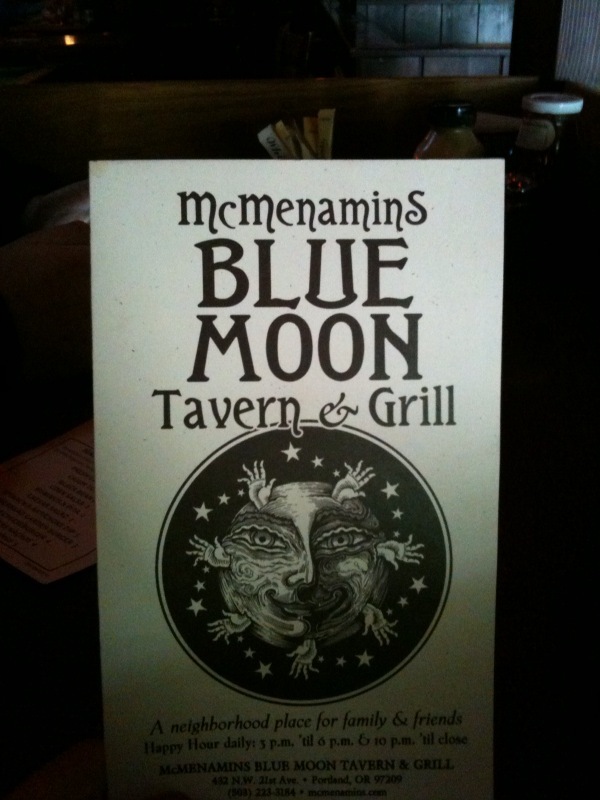 Michael and I ran errands (tile shopping) Saturday and while we were out, we stopped at the McMenamin’s Blue Moon restaurant for a late lunch. All McMenamin’s are unique and kooky in their own way. The Blue Moon is in NW Portland (a yuppy area) where there’s high end boutiques, fancy restaurants, and no parking. 🙂 But McMenamin’s is pretty low-key and down to earth. We sat by the fireplace to have lunch. It was nice and quiet, romantic and the fire smelled wonderful. 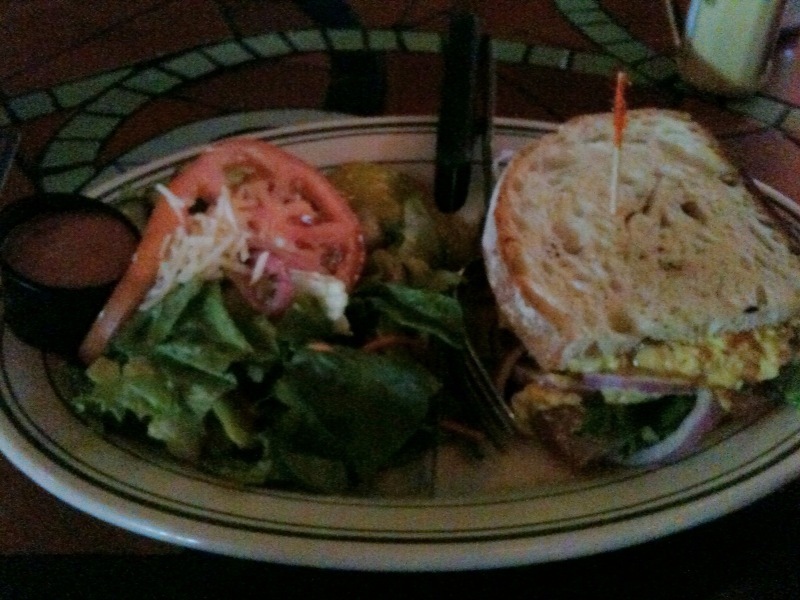 Since it was pretty late and I was going out for dinner with the girls, I got a half curry tuna sandwich and a side salad with raspberry vinaigrette dressing. The sandwich was interesting…more curry and chutney than I was expecting! I’d had a nasty headache all day that would not go away. 🙁 After lunch we went back to the house to take a nap. That didn’t help my headache, unfortunately, but I went out to the party anyways. 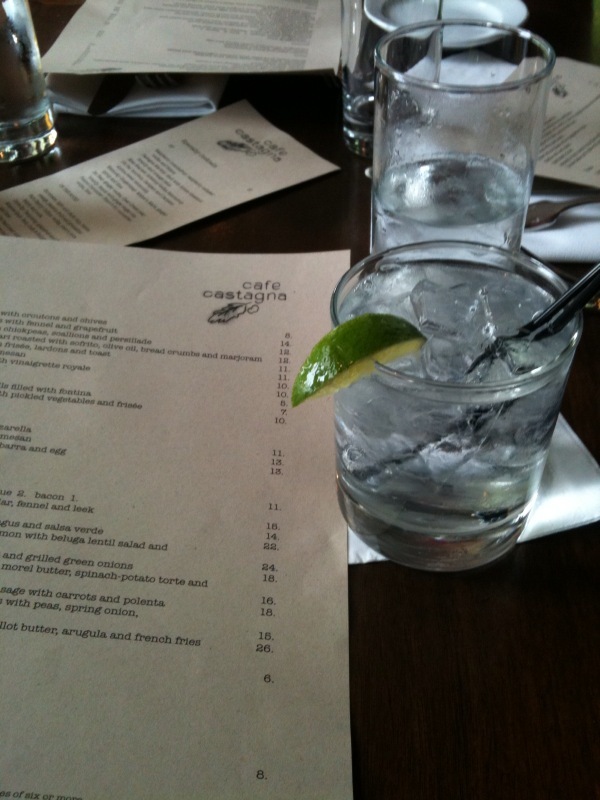 Dinner with the girls was at Castagna Cafe in SE Portland. I ordered a Vodka tonic. I nibbled on some bread and butter. 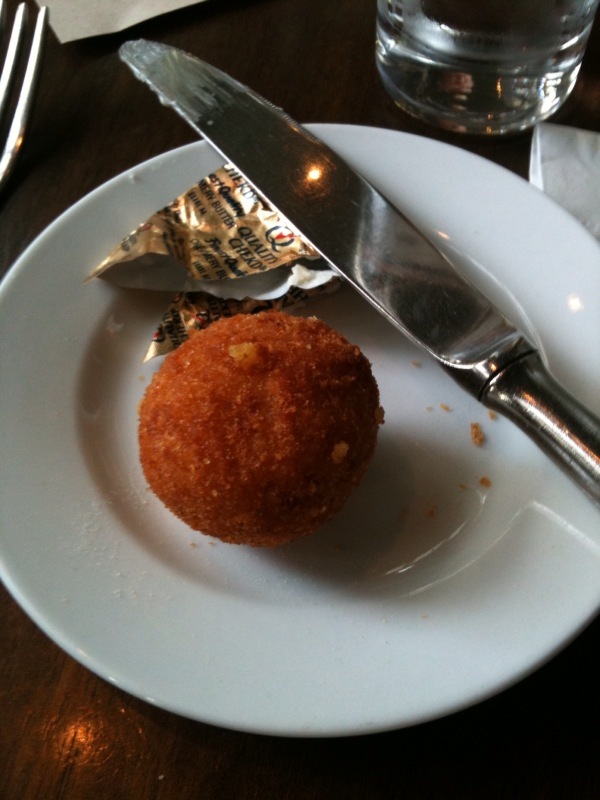 And I ate one of the “arancini: fried risotto balls filled with fontina”. It was good! 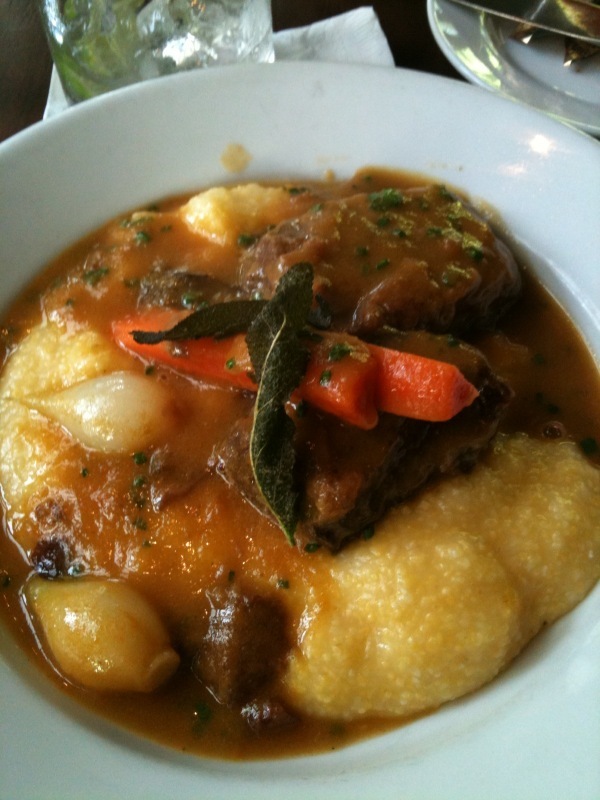 For the entree, I ordered the pork cheeks braised in white wine and sage with carrots, pearl onions and polenta. It was absolutely delicious! The pork was so soft and it melted in my mouth. I didn’t need a knife to cut it, that’s how fantastic it was. I’d never had polenta in this form before, and it was surprisingly good too. Even though I was pretty full, I really wanted to get dessert. 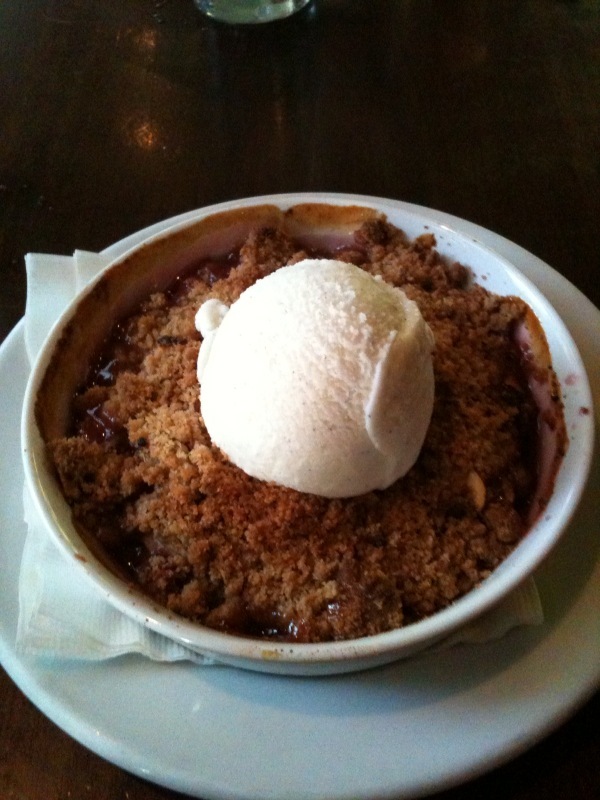 The rhubarb, strawberry and almond crisp with vanilla ice cream was calling to me. I hadn’t had rhubarb anything since I was a kid and it was just as sweet and crunchy as I remember! 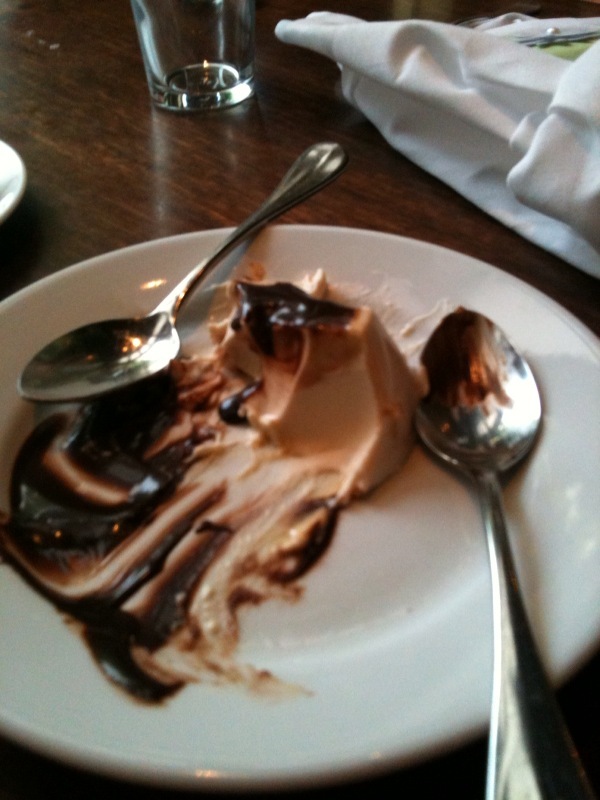 My friend Erika got the Cocoa nib panna cotta and I had a bite of that. It was like eating pudding. 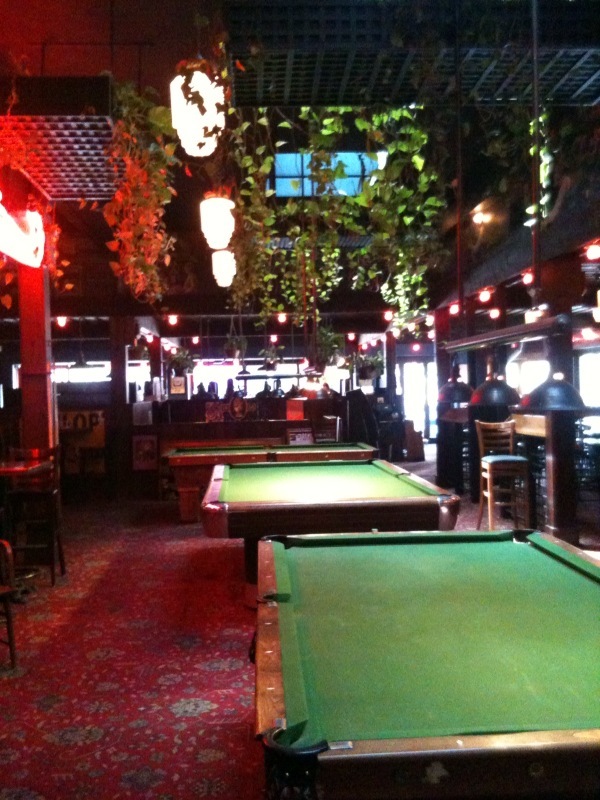 And then we headed to the Slingshot Lounge to meet up with the boys. 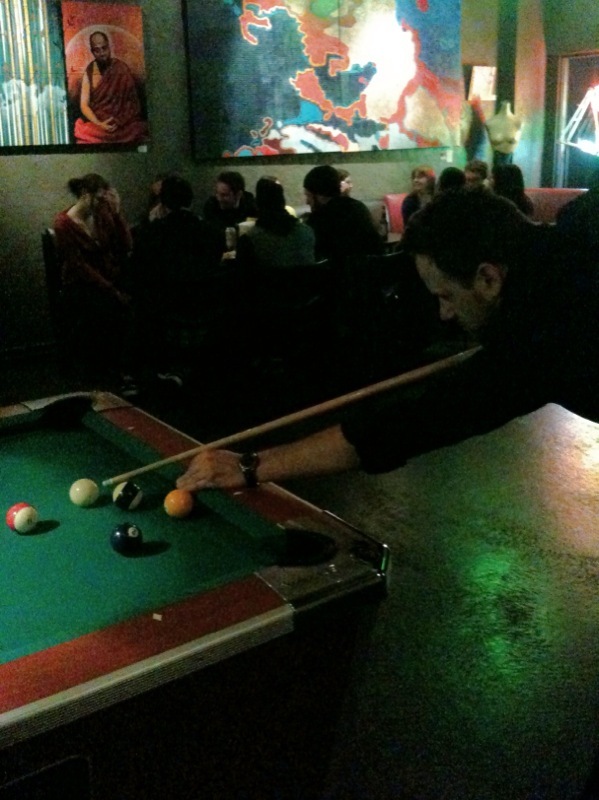 Michael and I played a few rounds of pool. 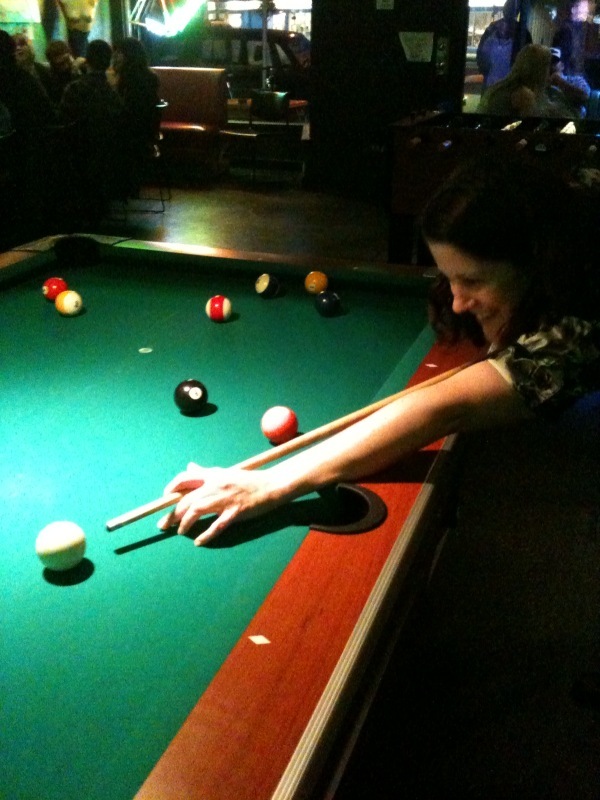 But Michael gave me some pointers and I started to get a little better. I ordered one more vodka tonic and that was my limit for the night. That dang headache was still hanging around. We had a great time! QUESTION: Are you married? 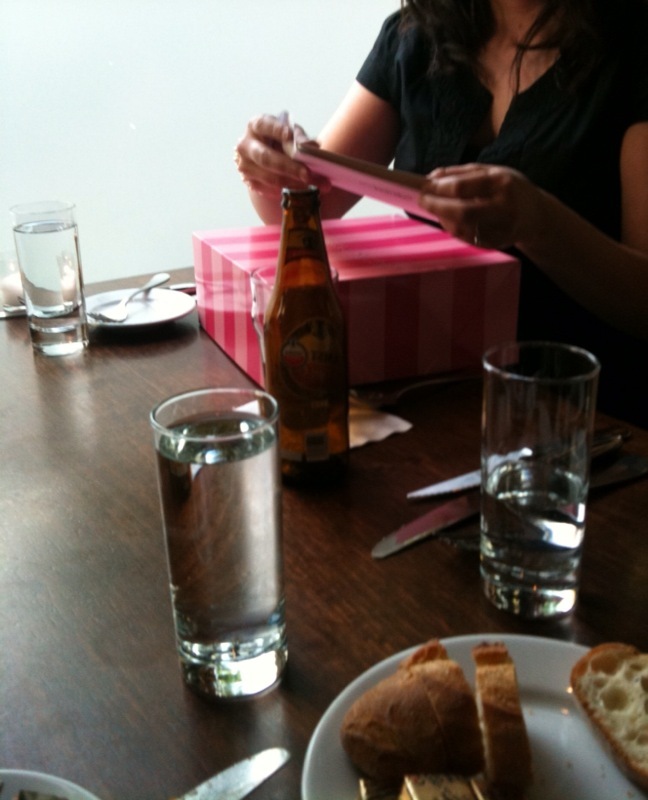 Did you have a crazy bachelor/bachelorette party? I’m not married but don’t really know if I’ll have a crazy bachelorette. I’m not really into that stuff. The food looks amazing though – especially the dessert! Big ups for going out with a headache. I have one right now and can barely figure out how I’m going to make it through a busy day. We’re in Seattle and will have to try that McMenamins as we’re big fans of some of the others. I’m not married either, but I couldn’t imagine myself having a huge bachelorette party. I would prefer a spa day and dinner with a few friends. I’m not the dancing type anymore and would need too many drinks to be one – but then probably wouldn’t be able to enjoy my party, haha. The food looks good, mmmm! I agree. I’m definitely a spa-day kinda girl! I didn’t have a crazy bachelorette party as such – but we all got dressed up for an afternoon at the races which was lots of fun!! !